Want More People to Leave? Mayor Emanuel and the CTA now have approval for a new Transit TIF which will fund the much-needed RPM Red Line Project. And the much-NOT-needed Brown Line Flyover at Belmont. Is this really a good time to ruin Central Lakeview, one of Chicago’s best-loved neighborhoods, gutting blocks and blocks of its heart for a cement CTA Flyover?? Is a $570 million “Signature Project” Flyover which will shave a precious 20-30 seconds off 40% of Red Line commutes really something we want to waste our tax funding on? Hey, maybe more people will want to leave, huh? Here’s Central Lakeview before – and after – the CTA Flyover. The O’Hare Express Craziness Is Back! The very crazy, $$multi-billion scheme of an express train for the rich to the city from O’Hare is alive again, courtesy of Mayor Emanuel! Maybe our mayor thinks announcing something this outrageous, glittery, and expensive will take attention away from the police killing of Laquan McDonald & the cover-up, the CPS disaster, or the violence everywhere in Chicago, to mention a few of his problems. But shouldn’t Rahm worry we’ll actually take a look at THIS idea?? With the Blue Line, Chicago already has one of the most efficient airport-city transit connections around. And when the CTA’s “Your New Blue” update to tracks and stations is completed, that trip will be even faster, smoother. An O’Hare Express Train – Who benefits? And, sadly, not the giant, gaping hole under Block 37 that will never connect a train to O’Hare, but will continue to cost us all $400million + interest since the last time this Express Train idea took hold. A mayor who wants another shiny thing to brag about. Just like the Belmont Flyover. Both these “accomplishments” will be best viewed from very, very, vey far away. Why not build the O’Hare Express Train? The CTA is eager to spend $570 million+ on the Belmont Flyover to shave a mere 20-30 seconds off only 40% of the rides downtown for North Side Red Line riders. Meanwhile, they’re busy ignoring a simple, inexpensive CTA/Metra fix which would vastly increase commuter service along a long corridor of the South Side, bringing people to jobs and vitality to multiple under-served neighborhoods. How about a real increase in transit service on the South Side for a change? Transit Activist Michael Payne, author of the Gray Line proposal, has been proposing this simple, good idea for years. Now, some South Side groups are giving it a push. Here’s hoping the CTA can finally listen. A dozen neighborhood organizations, along with the Active Transportation Alliance and the Center for Neighborhood Technology, are calling for the Metra Electric line, with its three branches that run through several South Side communities, to operate like a CTA ‘L’ line. The Metra Electric serves many key destinations on the South Side, such as the University of Chicago, the Pullman district, Chicago State University, the Museum of Science and Industry, Governor’s State University, McCormick Place, the South Shore Cultural Center, and the proposed Lakeside Development. The communities surrounding its stations are densely populated and walkable, ideal areas for rapid transit development. Loop Link: $32M To Go .75 MPH Faster?? The CTA wouldn’t waste $32 million just to speed up Loop bus service from 3 mph to 3.75 mph, would they? Yes, they would! And they’re proud to say so. As Blair Kamin reports: According to CTA spokesman Brian Steele, the agency seeks to increase peak-hour bus speeds to 3.75 mph from the snail-like 3 mph that was the average before the system made its debut. In off-peak hours, the goal is to get speeds up to as high as 6 mph. Next, the CTA plans to bulldoze 16-20 buildings in the heart of Central Lakeview and waste $570+ million to shave 20-30 seconds off 40% of Red Line trips downtown. Are Riders Being Thrown for a Loop? The driving idea behind Loop Link, the Emanuel administration’s attempt to speed CTA buses through traffic-clogged downtown streets, is to make bus service more like rail service — in a word, faster. In this optimistic spirit, the city refers to Loop Link bus stops as BRT stations, short for Bus Rapid Transit. But three weeks after Loop Link’s late December debut, the “R” in BRT seems more aspiration than fact. Let me illustrate with a “bus versus man” experiment I conducted during the Friday morning rush. First, I rode the CTA’s No. 20 bus down Washington Street, a key corridor in the Loop Link network. The trip from Canal Street to Michigan Avenue took 13 minutes and 22 seconds, a rate of 3.6 mph. Then, I walked the same route, moving, I hesitate to add, at an ambling pace rather than top speed. That took 14 minutes and 49 seconds, which works out to 3.25 mph. So bus beat man, but not by much. Which may lead you to ask: Is Loop Link a $32 million boondoggle? To be fair, the so-called express bus system is going through a breaking-in phase and remains very much a work in progress. To Chicago’s credit, Loop Link is an ambitious work of civic infrastructure, one that for the most part balances competing agendas and transcends the purely utilitarian approach that many cities take to such projects. Still, the jury remains out and expectations aren’t high. Even if Loop Link achieves its modest goals, the time savings for riders won’t be huge. According to CTA spokesman Brian Steele, the agency seeks to increase peak-hour bus speeds to 3.75 mph from the snail-like 3 mph that was the average before the system made its debut. In off-peak hours, the goal is to get speeds up to as high as 6 mph. Flyovers First! Disabled Riders Can Wait. It’s great that the CTA finally is talking about making all its transit stations accessible for riders with disabilities. It’s not great that they’re giving themselves 20 years to do it. First, they have more important things to do! Their urgent priority is to spend $570Million+ and gut Central Lakeview to build a Brown Line Flyover, all to shave 20-30 seconds of 40% of Red Line commuters’ trips to work. Seriously. That’s their first priority. Yes, upgrade the Red Line stations and track infrastructure. But waste $570Million on this crazy Flyover while disabled riders continue to wait? The CTA is about to start looking at how to make its rail system completely accessible to riders with disabilities within 20 years, agency officials said Wednesday. The agency expects to publish a report late in 2016 or early 2017 on the initiative, which would outline new capital improvements and concepts necessary to make every CTA train station accessible to those who use wheelchairs or devices such as scooters. Currently, 99 of the city’s 145 ‘L’ stations, or 68 percent, satisfy regulations put forth in the 1990 Americans with Disabilities Act, CTA spokesman Brian Steele said. Whose Name on this ‘Signature Project’? Next, by tapping into all sorts of federal pots, they’ll use federal funds to magically meet the state and local funding requirement to build the Flyover. 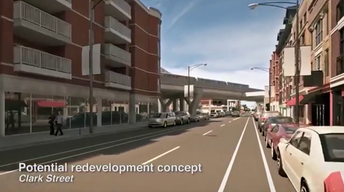 Who will want their name on the Belmont Flyover in 10 years when Central Lakeview – a major restaurant, theater, entertainment district – has been gutted, turned into a permanent under-El wasteland to save some commuters 20-30 seconds on some of their trips downtown? Who will want their name on it in 20 years when the CTA has failed to maintain it and riders are taking that shaky curve up over other elevated tracks, 45 ft.+ high in the air? So, which of the politicians happily boosting the Flyover now will want his name attached to this nightmare for years to come?